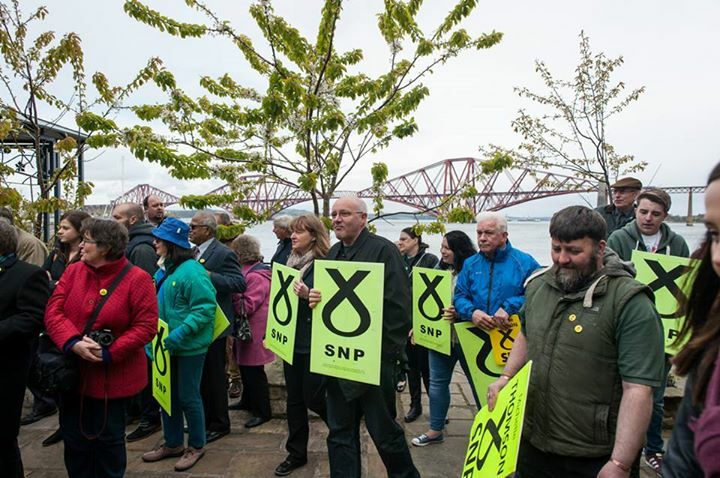 Spotted campaigning with my wife in South Queensferry this morning. 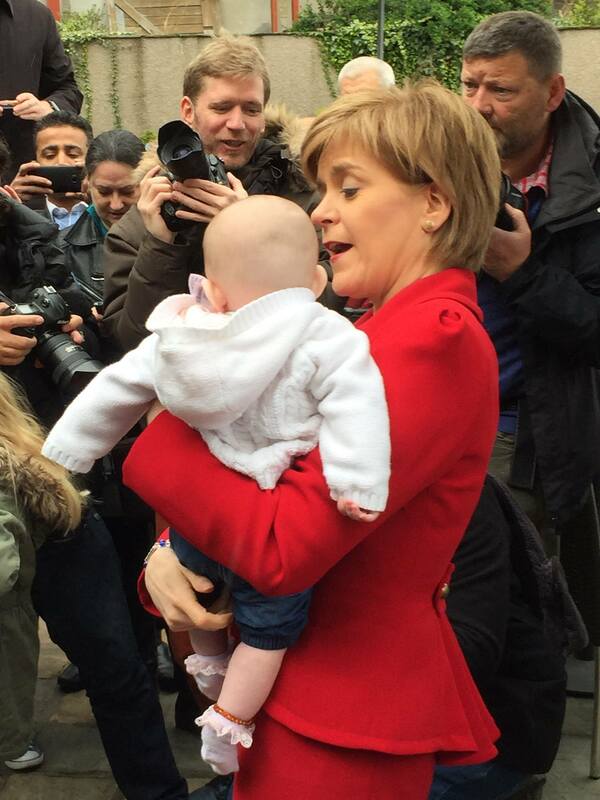 On the campaign trail with Nicola Sturgeon. The classic baby shot with a good private quip to the mum to go with it. 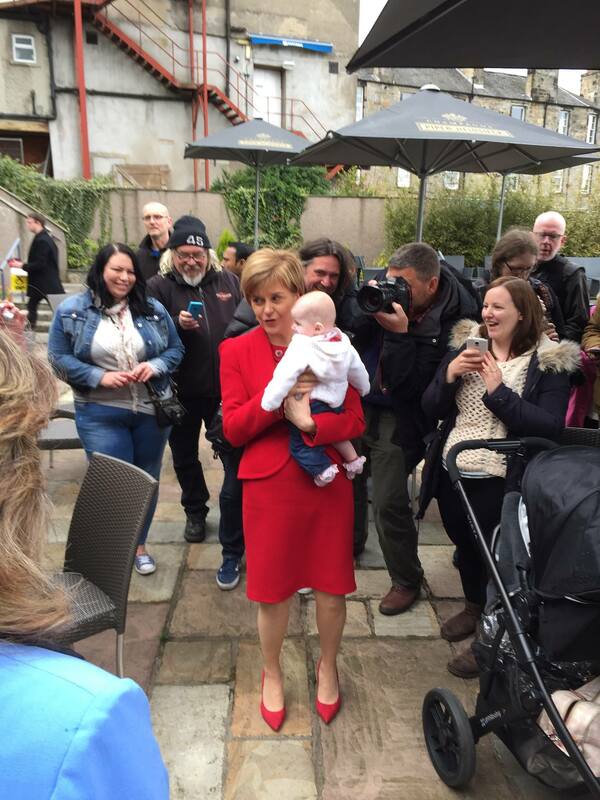 Nicola was visiting our constituency today. For the first time in my life I live in a marginal seat and so it’s super exciting. My vote now actually counts for something. She didn’t make any speeches; it was mainly TV interviews. But I was quite taken aback at her size. She really is very petite indeed and that just adds greater irony to the way she is mauling the London big boys. A tiny wee lady from a council house upbringing (her Mum still lives in the same house) that went to a comprehensive school and is walking, no trampling, all over the Westminster elite establishment. You couldn’t write the script could you. 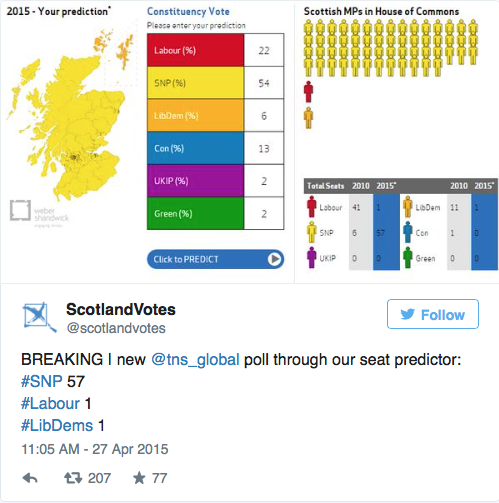 TNS poll 27 April 2015. The party activists I spoke to today were talking this down. Anything in the 40’s would be a major achievement they said. Some of the journalists I spoke to were warning of a subtle shift in momentum in England back towards the Tories and that Cameron’s dogged defence of his economic policy is resonating. What’s more. remember this many Tories do not show their hand in opinion polls as they find it a bit embarrassing so their vote may be stronger than pollsters can measure. Of course that won’t matter in Scotland. What will matter here is SNP turnout. If we can mobilise our vote maybe, just maybe, that poll above might not be pure fantasy. 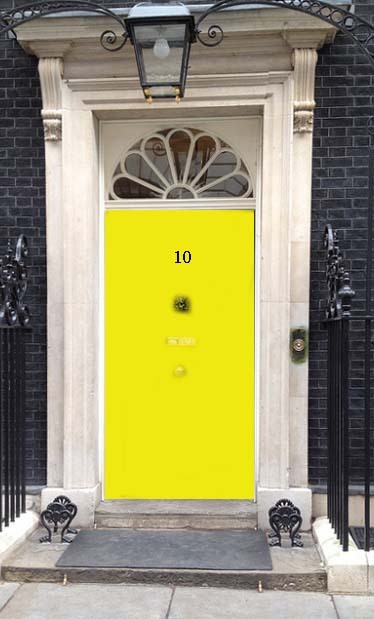 As if David Cameron didn’t have enough to do. He’s had to get the painters in. It’s such a challenging job at the best of times. I should have put this up four months ago. 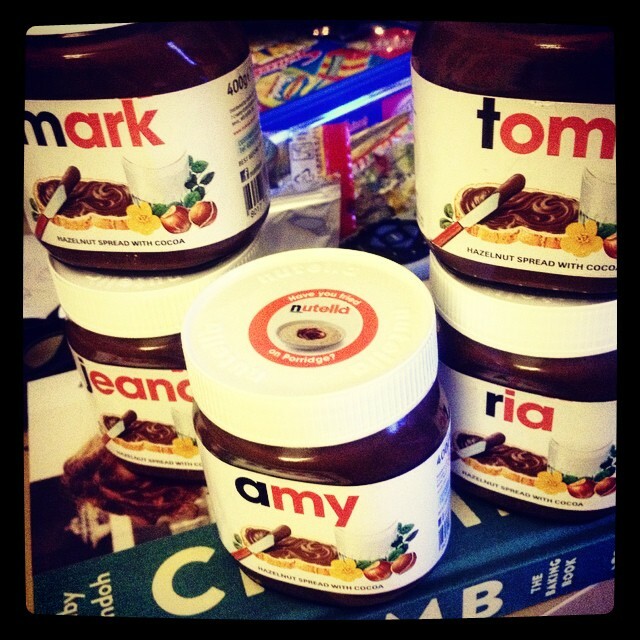 The first time ever that Jeana has had a personalised gift. 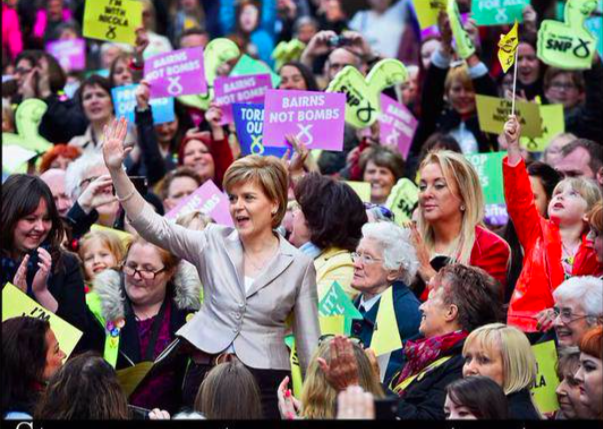 Sadly I wasn’t in Glasgow today but this picture is worth a million words. Nicola crowdsurfing her way to formidability. How to win an election. Britain’s most credible politician. 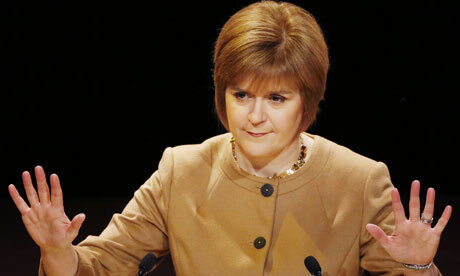 Nicola Sturgeon, is about to recalibrate political possibility. This article in today’s Guardian really hit me. It’s not a Scottish newspaper but Ian Jack clearly knows his facts and has done a ton of research to make the piece credible, not puff.. Admittedly it’s a big read, but an intoxicating one, because its author is both objective and balanced in his critique of Nicola. What most impressed me was the fact that she lost 8 elections across 15 years in unwinable seats as she learned her trade (whilst holding down a legal day job). By contrast The unholy neoliberal triptych of Cameron/milliband/Clegg lost one between them as they ponied their way from Oxbridge into career politician safe seats. This article makes Nicola seem unprecedented. But I can think of a comparison. And she was female. And she was formidable. And she was brilliant. The trouble is her Iron politics stank. On May 7th I hope Scotland takes this remarkable article to heart and universally announces its utter disdain for Neoliberalism and the Westminster sham that we are paying for. This is real politics from a woman that “gets” what matters to people in Scotland and really everywhere else in Britain where self interest isn’t the priority. History can be made if we hold our nerve (and Independence is not even in the manifesto). So you can chill about that.